In conjunction with one of Melbourne Museum’s most popular exhibitions, Titanic: the Artefact Exhibition, IMAX Melbourne have re-released the original 2003 James Cameron documentary to create the definitive Titanic experience for museum goers. Before Avatar and after his blockbuster movie The Titanic, Cameron did the unthinkable and spearheaded one of the world’s most ambitious explorations to date. The idea was not only to film the wreckage of the Titanic but also go inside this majestic ship and thanks to 3D technology, it makes the viewer part of the crew that Cameron has assembled. 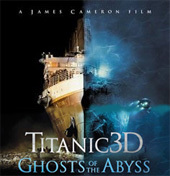 Titanic 3D: Ghosts of the Abyss is hosted and narrated by Bill Paxton, a close friend of James Cameron who acts as the lay person between the historic and marine experts and gives a very human face to this documentary. It’s great to see Paxton’s emotions throughout the movie, especially at the start where it finally dawns on him that he is about to go 12,000 feet underwater to the legendary wreck of the Titanic where 1,500 people lost their lives. To compliment the amazing footage of the wreck which is quite surreal at times, Cameron adds his movie flare to this documentary by superimposing “ghosts” onto the actual wreckage itself. Actors stage certain events on this doomed ship which gives a real insight into life aboard the ship and its final moments. There is an interesting discussion at the end of the movie about what the crew of this expedition would do in the shoes of those aboard the Titanic and if heroism would be included. Needless to say, it all comes together quite well. The documentary is quite emotional at times as you witness the cabins and artefacts of those aboard the Titanic, especially the end which showcases the family photos of the actual people onboard the ship. As this was filmed in 2001, there is one point in the documentary where the crew learn of 9/11 which puts everything in perspective for them, however through strength and determination, they decide to continue their cataloguing of the ship. As the two three manned submarines can only take the crew to the exterior of the Titanic, new technology was developed to explore the interiors of the ship. Thanks to two mini robotic cameras called Jake and Elwood, this allows the crew to film inside the Titanic from the cabins to the grand stair case and other amazing facets of this underwater wreckage. At times, it’s quite eerie and although rust has claimed much of the exterior of the ship, there are some rooms that almost look untouched and contain personal items and the like. There is one scene where one of the submarines shines light onto a magnificent led-light glass window that had audience goers gasping with amazement. In terms of video quality, Titanic 3D: Ghosts of the Abyss looks fantastic on IMAX, especially at the start as the 3D effects work so well. It’s a shame that the cameras on Jake and Elwood are not as detailed as the two submersibles but through some clever editing, Cameron uses other effects such as putting images upon images, whether it’s computer generated images of the Titanic or real photos of the ship to compliment the entire experience, making it an almost interactive documentary. In conclusion, Titanic 3D: Ghosts of the Abyss is a very entertaining and surreal documentary that boasts some amazing underwater photography of this legendary wreck. Even though the footage is not as one might hope, Cameron uses a variety of tricks and new technologies to highlight this experience such as the lights of medusa to heighten the quality of the 3D cameras and the ghostly actors that are superimposed on the original wreckage. For a documentary, Titanic 3D: Ghosts of the Abyss is a very moving experience that not only provides the right visual cues but gives you an interesting history lesson as well. I would definitely recommend that when you visit the Titanic: the Artefact Exhibition, you see the IMAX movie to compliment that experience.